Most days, I bring my lunch to work. Last year I was really into avocados smashed onto whole wheat toast with a sprinkling of salt. The year before that was soup. For 2011, I’m into quinoa. 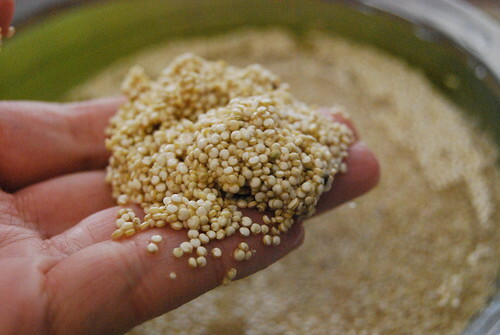 Quinoa is an edible seed and has been identified as a superfood. It’s a complete plant-based protein but without the fat and cholesterol you typically find in meat. 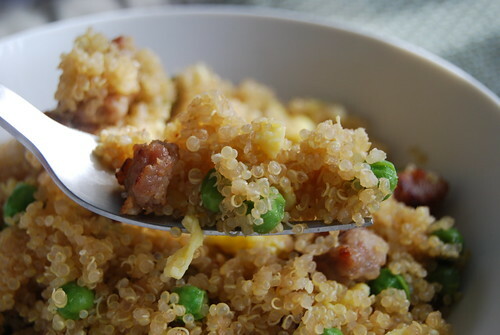 I love quinoa because it can substitute white rice in many dishes including my one of my favorites: fried rice. The preparation of quinoa is much like rice: rinse until clear, then boil or steam. Unfortunately, quinoa has a hard and often bitter exterior so rinsing is an absolute necessity. And the size of quinoa is much smaller than rice — think couscous size. For fluffy quinoa, I rinse two cups twice and boil in salted water for 15 minutes. After 15 minutes the quinoa is strained and rinsed under cold water. As it drains, fill the same pot with water again. Once the water is boiling, steam the quinoa (still in the strainer) over the boiling water for 15-20 minutes until fluffy. 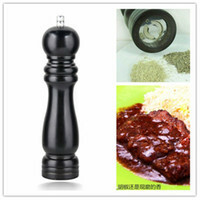 It’s now ready for a multitude of uses including fried rice quinoa. Heat 4 cups water in large saucepan until boiling. Rinse two cups of quinoa in water twice. Add salt and quinoa to water and boil for 15 minutes. Remove pan from heat and rinse quinoa in strainer and drain. Clean saucepan and heat 2 cups water until boiling. 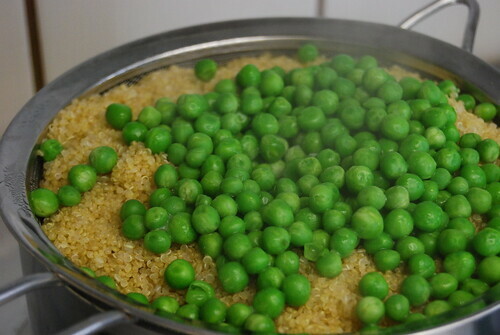 Leave quinoa in strainer, add peas on top of quinoa and steam over boiling water for 15-20 minutes until quinoa is tender. 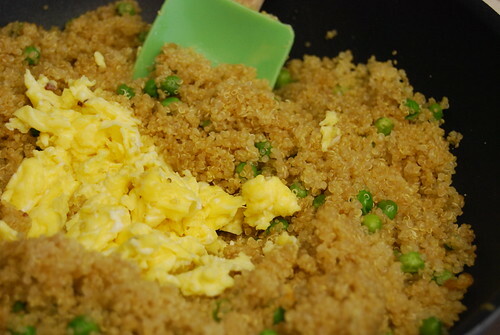 While quinoa is steaming, cook scrambled eggs and meat. Set aside. Heat vegetable oil over medium in wok or large frying pan. Add cooked quinoa and peas. Add eggs and meat combining everything. Add soy sauce and sesame oil. You actually want me to try making quinoa (finally). Fried rice and I’m there. Fried rice is one of my favorite dishes. A complete meal in one! I am lazy when it comes to quinoa. I give it a good rinse, but then I just throw it in a pot with water and let it cook in one round. Never thought about turning it into fried rice, though… sounds healthier than using rice! I went through a quinoa phase, then a polenta phase. Most of my work lunches now include some form of ground turkey. I’ve cooked it both ways: steaming it and tossing the quinoa in broth. I like the fluffier version although it’s a LOT of work with the steamer, etc. I always cook a huge batch on Sunday so I don’t have to fuss over it during the week. I think sardines and quinoa will is a healthy powerhouse. Maybe toss some herbs in there too? Hmm..
Oooh, sardines sound good over quinoa. Alternatively, throw in some Chinese sausage and completely negate all of the health effects of quinoa. 😉 So great to hang out with you ladies last night! My mom has used chinese sausage to different variations of fried rice. I have YET to introduce Paul to it. Maybe that’s something to do this weekend. So great hanging around with you too! hi darlene – did you win any bacon last night? I love white rice but afraid it’s a high-glycemic food so I occasionally sub it out with brown rice or quinoa. I prefer quinoa over some brown rice. I have a box of quinoa sitting in my pantry, waiting for me to give it a second chance. I think I will since it seems I made it wrong in the first place. Thanks for the tips! Second chance, huh? What happened the first time you attempted quinoa?? This is only one way to cook it but I prefer cooking it this way for fluffier quinoa. Hope it works out for you! I have no idea but it certainly didn’t look like yours. I’m on it though. I love this but never buy it b/c I don’t know how to cook it!! Thanks for sharing!!! Thank you for visiting. Let me know how it goes.